Happy Hump Day! 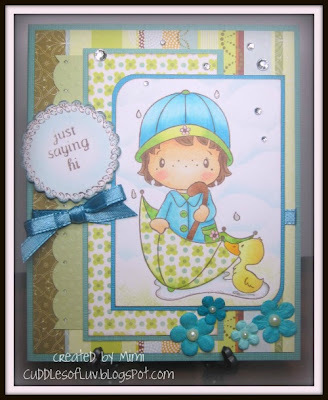 Today I'm here to remind you there's still plenty of time to play along with All That Scraps Wednesday Challenge... ANYTHING GOES! and while you're there check out the ATS blog for preview review of all the cute new April releases! So, now it's your turn to create something and link it up HERE! Be sure to read all the deets, cuz there's a really awesome prize for one lucky winner! Super, super cute Mimi!! Love how you paper pieced the umbrella and your coloring is gorgeous. Super sweet card with the new image! Love the colors and the paperpiecing! 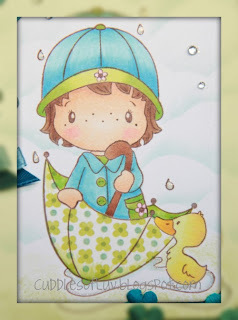 Super cute card, thanks for playing with us in this weeks "April showers" challenge at Going Grey with Scrap-Creations.